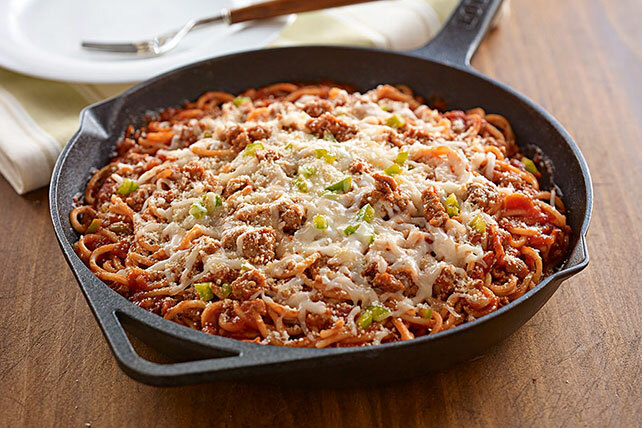 Discover your new favorite weeknight dish with our delicious Italian Pasta Skillet! You only need 30 minutes to make this cheesy Italian Pasta Skillet. Cook turkey in large skillet until done; drain. Stir in sauce and water; mix well. Bring to boil. Stir in spaghetti; cover. Simmer on medium-low heat 15 min. or until spaghetti is tender. Sprinkle with cheeses and peppers; cover. Cook 2 min. or until mozzarella is melted. Substitute 3 cups uncooked rotini for the broken spaghetti.